Stash Tea Chamomile is one of the purest products we have featured in this list. It is also a very popular brand that is often found in grocery stores across the US and the world. Stash currently has a 4.6 star rating on Amazon, which is a near perfect score. So let's see why people love this brand so much. Stash is a great brand who's products feature pure ingredients with no artificial flavors or additives. Stash Tea Chamomile is no different. Their tea gets the job done without the use of additives. Not to mention that with this Amazon exclusive pack, you are able to get a whole lot of tea for a low price. Stash is among the few high end grocery store tea brands, that have their product widely available for all to enjoy. Stash Tea Chamomile is by far the purest tea we have featured in this list. This is because their ingredients for their chamomile tea is just 100% pure Chamomile. Nothing more, nothing less. No artificial flavors, colors, additives, preservatives, no chemicals, no caffeine, nothing but chamomile tea. And unless it is a blend of different flavors, that is really all that is needed. There is no need to include other ingredients or herbs in a tea like this. Chamomile has a bunch of great natural benefits without the use of other added stuff. Of course, some teas add other herbs to give the tea a bit of a boost, but Stash Tea Chamomile focuses on pure and simple ingredients. Chamomile is an amazing herb with a bunch of great benefits. It is mainly used for relaxation, but it can also be used for a number of other issues. These can include soothing your stomach, improving back pain, reducing inflammation, helping with arthritis, skin irritation and even sunburn. The tea is wonderful and highly beneficial, even if you are just looking to relax a bit. Herbal teas in general have a lot of great benefits to them. Regardless of the type of herbal tea you are drinking, there are somethings that you will be take advantage of. One benefit that you will get from all tea is weight loss. Now, this is not like the tea will burn off fat. Rather, the best herbal tea will remove water retention, so you will visibly look slimmer because you will lose a lot of your excess water weight. Another great thing about herbal tea is that you get a access to a wide variety of antioxidants, vitamins, minerals, and other nutrients. Because herbal tea often features a combination of herbs, you are able to take in a variety of great things that can be highly beneficial to your body. Other common health benefits of the best herbal tea include relaxing the body and mind, aiding in sleep disorders, reducing inflammation, easing various pains, protecting against common diseases like the cold or flu, boosting immune system, regulating the digestive system, and stimulating cognitive function. Stash Tea Chamomile offers a tea designed to relax your body, mind, and soul. But if need be, it can also help with various bodily issues like upset stomach, and arthritis. While no product is perfect, Stash Tea Chamomile is the closest we are going to get. There is a reason that Stash Tea Chamomile is one of the more premium brands on the market. They are not only inexpensive, but they actually deliver very well. The 12 pack gives you 12 bags of their chamomile tea, each with 10 tea bags inside. This allows you to have enough tea for roughly 4 months, assuming you only drink one cup of tea a day. Pretty much, the only downside I could find for this product was that some people were complaining about the taste of the tea. A handful of people mentioned that while other Stash tea flavors were very enjoyable, their chamomile fell a bit flat. This could be just due to a bad batch, or just personal preference. I say this because of all the reviews for this product, only 3% of them are one star and the common complaint was the taste. The rest of the 347 reviews were very positive. Starting in 1972, Stash Tea Company began selling loose herbal teas and bulk herbs to natural food stores. By 75, the company expanded to bagged teas and started to include a full line of traditional, specialty blend, and herbal teas directly to fine restaurants. Today, they are based in Tigard, Oregon and are one of the largest specialty tea companies in the US. It is incredibly easy to find their products in nearly any grocery store or other food stores, including many restaurants as well. Their tea is also available in various other countries, including Canada. The 12 pack supplies you with enough tea to last up to 4 months on one cup a day. Chamomile is perfect for relaxation. But it can also help with soothing various aches and pains including arthritis and stomach pain. 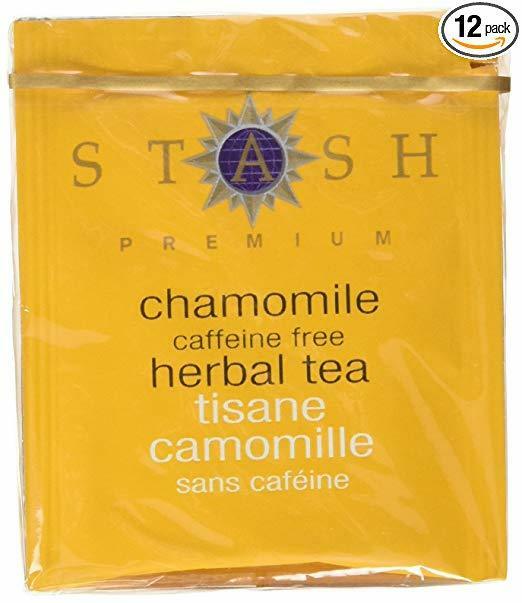 By using only pure chamomile, Stash Tea Chamomile offers a great tea, pure and simple. Some customers have mentioned that the flavor of their chamomile is not up to par with some of their other flavors. Some people may not be used to the taste of pure chamomile, because this tea only uses chamomile without any fillers. However, people may just not like the taste either, and that is totally fine. There is a reason the phrase "Not your cup of tea" exists. Nevertheless, Stash Tea Chamomile is a great brand that offers top notch quality with simple ingredients, to make sure you are getting pure tea, nothing more or less. Overall, Stash Tea Chamomile is a great brand that you will not regret buying from. Their ingredients are high quality and offer some great health benefits. If you want to try them out for yourself, you can grab their 12 pack for $21.97. For more information about the best herbal tea, check out the rest of Green and Growing. Here are some top questions that I found for people seriously considering buying the Stash Tea Chamomile Herbal Tea. Is this tea and packaging bpa free? This tea and the tea bag packaging does not contain BPA. The filter paper used for Stash Teas is made from 100% cellulose fibers. Are the tea bags individually wrapped? Yes, they are sealed in foil packets.